If you’ve ever wanted to experience the countdown to New Year’s away from home, Gatlinburg and Pigeon Forge should be two spots you should put on your “to-do” list. Expect many locations to host a New Year’s Eve party or special shows. Head on over to the base of the Gatlinburg Space Needle to enjoy a live band, fireworks and choreographed music with LED lights. It’s a completely free event that’s been happening for almost three decades (this is their 28th year). If you’re trying to find the Space Needle at night, it’s at traffic light #8, around the intersection of Parkway and the Historic Nature Trail. 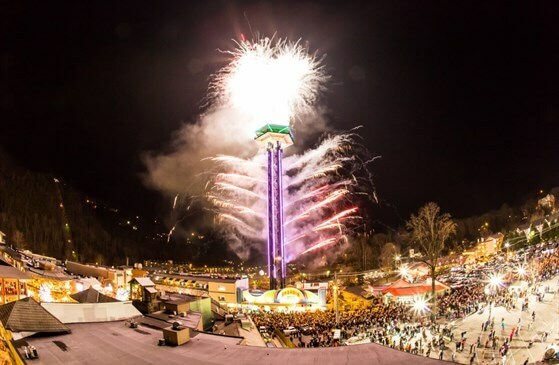 If you’re interested in learning more about the Annual New Year’s Eve Ball Drop and Fireworks Show, contact the Gatlinburg Convention and Visitors Bureau at 800-588-1817. Most of the action takes place starting around 10pm, but since it’s so popular, plan on getting there early and enjoying downtown. If you want to stay in Gatlinburg, book early! Rooms sell out fast. Keep this list handy for next year if you miss out this year on a close place to stay. These are under a 15-minute walk. The Greystone Lodge on the River—Across from the Gatlinburg Welcome Center and next door to Ripley’s Aquarium of the Smokies, this is a great place to stay if you plan to walk to the Gatlinburg Space Needle. Bearskin Lodge—Right off of Parkway, you’ll be right on the border of the Great Smoky Mountains National Park. You can always drive. River Road has some spots for free parking, but there are other private lots in the area that charge a flat fee. You can also park at the Ripley’s Aquarium of the Smokies or the McMahan Parking Garage. Consider staying in Pigeon Forge or Sevierville at one of the many lodging options rather than driving into Gatlinburg. Check our Lodging section for a full range of options for staying in the area. The Island is having their 3rd annual New Year’s Eve Celebration which kicks off with live music on December 31st, and is geared for the whole family. Enjoy free festivities starting at 8pm, free parking, and a concert by Fairview Union, a country rock band that hails from Eastern Tennessee. While you’re waiting to ring in the new year, you can stock up on next Christmas’ looks at the Christmas and More store. If you’re bringing your kids, they will love The Toychest Company, which has traditional and innovative toys from brands like Playmobil and Melissa & Doug. They can also make their own unique stuffed animal at the Build-A-Bear Workshop. If you’re planning an adult-only visit, then check out Ole Smoky Moonshine or Margaritaville (hey, it’s 5 O’Clock somewhere!). Country Tonite will host a special New Year’s Eve show with music and comedy and free gifts for attendees. You’ll get highlights from other Country Tonite shows and be visited by special guests like Santa, Frosty the Snowman, and the Sugar Plum Fairy. Balloons will fall from the ceiling at the stroke of midnight.